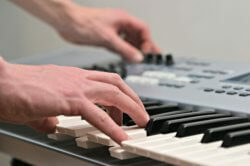 The piano became more popular than ever in the history of the piano during the Romantic Era (approx. late 1700's-mid 1800's). With the social rise of the middle class, the piano also became the most favored instrument in the home. During the 1800's, the orchestra expanded to more than a 100 musicians. According to the Romantic ideal big contrasts of effects were in fashion. Louder, softer and anything in between. Lots of expression! Concerts were no more available only to the privileged upper class, but also a growing middle class were able to enjoy concerts in concert halls. The instrument makers had to create sturdier pianos with greater sound for these larger venues, and to to be able to be used as a solo instrument with the increasingly large orchestras. 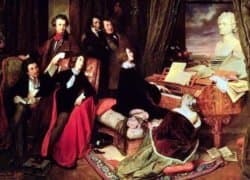 The worship of the musician as an idol, or almost mythical semi-god (the piano virtuoso Franz Liszt comes to mind) was another reason the concert venues got bigger; concerts were now available to a larger part of the population, and the admirers- fans- were more than ever. Around 1800, the upright piano was invented. 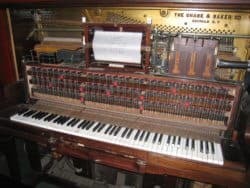 It had a louder sound than the Square piano, which also had been a popular and practical instrument for the home, and did not take up too much space either so it was a suitable replacement. The upright was the growing middle class’ number one choice for the home. The romantic era generally bloomed with new inventions and often bizarre designs. (Think Mary Shelley’s "Frankenstein" and "Dracula" ;- ). The piano was no exception. Many crazy remodels of the piano took place - but finally the “classical” design of the first pianos, as well as the upright piano, has proven to survive with its simpler beauty until today. 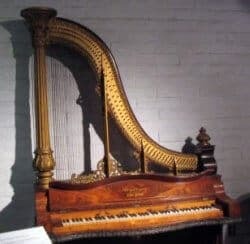 Imagine if Bartolomeo Cristofori, who invented the piano, could have seen this "Harp Piano"! 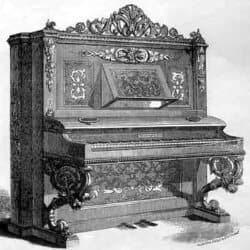 The Player Piano was invented by Henri Fourneaux in 1863. The history of the piano and its development continues during the 20th century with improvements for an even more perfect and stronger sound, scientifically and with masterly craftsmanship developed into the fine instrument we have today. The demand for perfection of sound in our days has a lot to do with the development of sound recording. 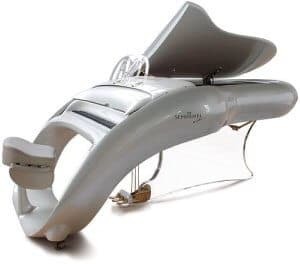 From the first gramophone discs in the early 20th century to the digital recordings of today- there is an ever increasing demand for absolute perfection in the quality of sound and tuning of the piano as well. The development of the electronic piano keyboards during the second half of the 20th century and onward, is a chapter of itself. This is a typical instrument of our own times; an “Electro-Phone”! It is interesting to think about that the music that pianists often play today, by Beethoven, Bach and Mozart for example- was written for instruments very different from the rather heavy and loud instrument of today. Would the earlier composers and pianists have liked the modern pianos of today? I am not so sure… and no-one will ever know. But I do love our contemporary instrument! Don’t you? It suits our time, I guess. Loud and noisy! 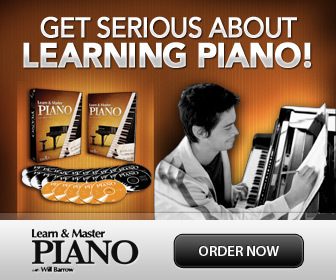 The history of the piano is a story with roots going back over 2300 years …wow. What a connection to the past! And this proud heritage is carried on worldwide throughout generations and in multiple styles and genres of music… imagine. The piano truly is a most magnificent instrument! So, do we have Bartolomeo Cristofori, who invented the piano, to thank for this? Well, even though he played and undeniably large part in the history of the piano, and has his name forever connected with the invention of the piano, we have to thank and think about all the inventors, instrument makers, musicians and composers throughout history. They have all contributed, over thousands of years, to develop their efforts and struggles into the fantastic instrument we are blessed to be able to play today!